My name is Randy McVay and I am the water superintendent for the town of Ingalls, Indiana. We recently went through a major expansion project that included, among other things, a new treatment plant, new wells, new water tower, and the addition of ozone as a disinfectant and oxidizer. When ozone was first mentioned to me, I must admit that I was a bit skeptical. I did not want to be the proving ground for some ‘new’ technology. I began reading everything I could find about the use of ozone in water treatment. What I found was that ozone has been used for over 100 years to treat water, it is a very strong oxidizer (about 50% stronger than chlorine) and has very few byproducts. It has been used to treat wastewater, and in too many other ways for me to list. I spoke to our engineers and asked them why they preferred ozone to more conventional aeration systems. They said that, in our system, we wanted to be able to produce 2 MGD in a more compact plant that would be possible with conventional treatment. They did not want to have a huge aerator sticking out of the building. They were also concerned about the possibilities of DBPs, iron bacteria and taste and odor. With ozone, we could use a much smaller building to house all of our equipment. Also, since it is such a strong oxidizer, we needed very little detention time, which reduced the size of our contact tanks. Lastly, there would be no DBPs produced by ozone in our water, iron bacteria was non-existent and there would be absolutely no taste or odor in the finished water. Once the treatment plant was completed, I was surprised at how easy it was to operate. After a short period of fine-tuning, the ozone generators worked great. 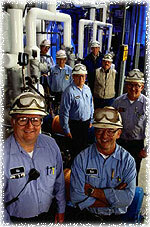 In our plant, we inject ozone into the raw water through six venture injectors. The water then goes to the contact tanks and then onto filters. This type of system is very simple and very compact. Operators are often surprised at how much water we can produce from such a small. After the water leaves the treatment plant, it is sent to a clearwell where we can off-gas any microbubbles that may be left after filtration. From there it is pumped into the distribution system. Now that the plant has been operating for a while, we have had time to evaluate the cost of operation, water quality, maintenance, consistency of treatment, reliability, etc. What I have found is that we can consistently reduce iron content to >0.05 in the finished water and manganese is non-existent. DBPs are also non-existent. Our water is absolutely clear with no noticeable taste or odor. Maintenance on the equipment is simple and takes very little time. The only downside was power consumption. Ozone production does require additional power over some other types of treatment. However, in our case, we had vigorously negotiated with our power supplier and got an exceptional rate. We also adjusted our ozone generators down to run at their optimal capacity. By doing this, we greatly reduced our power consumption. In the end, what we found is that ozone is a great alternative to, what we all considered, more conventional types of treatment. You can build a much higher capacity treatment plant in a more compact and efficient manner using ozone. Ozone is easy to produce, is cost effective and has very little DPBs. We have found the equipment to be reliable and easy to operate and maintain. The water we now produce is far superior to our old ‘conventional’ plant and our customers are very happy with the product we deliver. If you are considering building a new treatment plant, don’t be swayed by the argument that a more ‘conventional’ plant is the only way to go. Take a serious look at ozone, especially if you have taste and odor problems, DBPs, iron bacteria, have detected Giardia or Cryptosporidium or other potential problems. Ozone is cheaper than activated carbon, stronger than chlorine and doesn’t have the DBP problems associated with chlorine. Ozone can be added to an existing treatment plant as an alternative to chlorine in pre-treatment or incorporated in a new treatment plant as a the primary disinfectant and oxidizer. The equipment is small, relatively inexpensive and easy to operate. In closing, I would like to say a special thanks to the people who made this possible. First, the Water Board at Ingalls for being open minded enough to realize that ozone was better suited to our needs than other types of treatment processes. To our engineers, Triad and Associates, for their innovative thinking and an excellent design layout for our plant. To our general contractor, M. K. Betts, for their outstanding workmanship. And finally to all the fine people at CleanWater Ozone for their continued support and technical expertise. It was through the harmonious efforts of these groups that allowed this project to be completed on time and under budget. Click here to see photos and read more about the plant at Ingalls.